Highland Lakes gives active adults all the fun they desire at an affordable price. Central Florida covers the inland part of the state, stretching from Ocala in the north to Sebring and Lake Placid in the south. The lifestyle is a little different than in many of the coastal cities. Here, active adults love nature and golf. They enjoy riding horses and admiring wildlife, all while living in some of the best 55+ communities Florida has to offer. Your money goes a little further in this region, so we're taking a look at these neighborhoods that offer amenities, comfort, and recreational opportunity for less than $150,000. Before we move on, it should be noticed that the most popular communities in the region, On Top of the World and The Villages, are known for their affordability as well as their resort-style amenities. OTOW always has homes available for below $150k, while The Villages currently has several homes listed at or around that price. Both are good options for active adults who want an affordable home in a sprawling, active community. Affordable 55+ living is easy at Pine Run Estates in Ocala, where two clubhouses keep residents busy with clubs, events, activities, and ongoing entertainment. You’ll find pools, patios, shuffleboard and tennis courts, as well as some beautiful nature trails winding through the property. There’s a singles club, a travel club, and classes in aerobics and aquacize. Homes are simple and maintenance-free. You’ll find cozy two and three-bedroom single-family houses that range in size from 864 square feet to 1,500 square feet. Ocala is the place to be if you love horses. The entire area is populated with horse farms, equestrian centers, and riding lessons. Pine Run Estates is not far from Ocala National Forest, which is especially opportune if you enjoy hiking, kayaking, and camping. Check out the Appleton Museum of Art as well, which can be found at the College of Central Florida. Locals who become members can use that membership at over 75 other museums in Florida. You’re not near the coast in Central Florida, but you do have access to some beautiful freshwater lakes. This is especially true at Highland Lakes, a 55+ community in Leesburg that’s home to seven different lakes as well as marshy wetlands that attract birds and alligators. Moderately sized and affordably priced single-family homes and attached villas are available to buyers who want to surround themselves with nature. There’s an art gallery at the clubhouse, a driving range, and a woodworking shop. Residents enjoy shuffleboard, softball, and gardening. Leesburg offers some great antique shops, and so does nearby Mount Dora, which makes an excellent day trip, especially during the regattas on the water and the art shows downtown. You can also visit Venetian Gardens Park and PEAR Park, a recreation area that includes a spot for watching wildlife. Lake Wales is a serene, pleasant place to live, and at Lake Ashton, active adults can find a handful of resale homes for less than $150,000. This gated 55+ community is known for its marvelous health and fitness center, where residents enjoy a weight room, indoor pool, basketball courts, racquetball, and a 30,000 square-foot workout space. Homes are single-family or attached, and they come in a variety of sizes and floor plans. 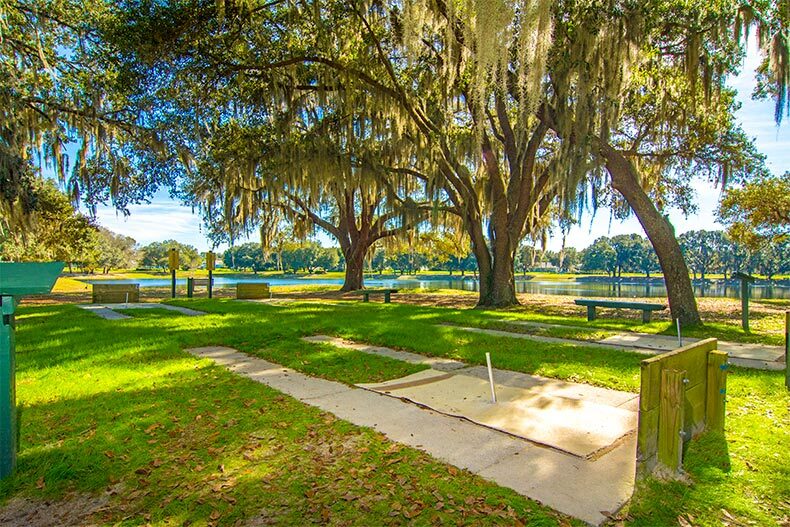 Lake Ashton is surrounded by some beautiful scenery, and the eclectic Bok Tower Gardens is nearby, where you can hear the bells sing and examine the towering pink structure boasting an interesting history. If you’re a Lake Wales local, you’ll eat at Vinny’s Smoke N Grill, where Veronica offers specials that aren’t on the menu (like Shepherd’s Pie and something called the Awesome Burger). Ross Prairie State Forest, which is popular with hikers and mountain bikers, surrounds Spruce Creek Preserve in Dunnellon. This active adult community is known for its beauty and its golfing. You’ll find The Preserve Golf Club, which is ideal for beginners as well as expert golfers. There’s also a fitness center, pools, arts and crafts, and RV parking available at Spruce Creek. Single-family homes are available on a resale basis, and many of them fall below the $150,000 price tag. The two- and three-bedroom properties range in size from 820 square feet to nearly 2,000 square feet. In Dunnellon, you can visit Rainbow Springs State Park and enjoy canoeing and walking. There are even a few waterfalls – rare in Florida. For more wilderness, head to Goethe State Forest, which is especially nice to explore on horseback. When you’re looking for a reasonably priced home in a 55+ community and fishing is your main source of recreational comfort, consider Foxwood Lake Estates. This Lakeland community has a number of single-family homes available on a resale basis to buyers who have a budget in mind. These are two-bedroom homes with two bathrooms and garages. The real draw is the fishing lakes, where residents can spend a relaxing hour or an entire day. There’s also a pool, shuffleboard, tennis courts, and a number of clubs and activities. The most popular groups include painting, line dancing, and bowling. Residents frequently get together for potluck dinners and pancake breakfasts. If you’re a baseball fan, be sure to catch a spring training game at Publix Field, which is home to the Detroit Tigers. There’s also some great hiking and wildlife viewing at Circle B Bar Reserve and Lake Parker Park. Local Lakeland residents are proud of their swans at Lake Morton, which is a pretty place for a walk or a picnic lunch (prepare to feed the birds).